The verdict on this pattern is: hmm. Overall I like it, but I feel like maybe my focus/skills weren’t quite up to the challenge of the placket. The placket is the big pink shape in the front, just in case you were wondering. I found it to be difficult to match the curves around the collar of the placket since I thought the pattern directed me to sew the inside facing first– meaning I had to press under the edges on the right side of the dress to form the finished placket. (Edited to add: I re-read the pattern and I did indeed misread it– It says to do it how I thought it should be done, I guess my brain was fried from work!) 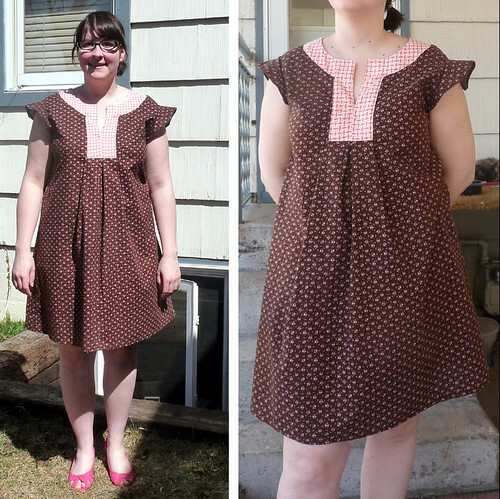 If I did it again, I’d sew the outside placket to the dress first, and then add the facing. In fact, maybe I was supposed to do it that way but I had a hard time comprehending the directions so I just went for it. If you use a matching fabric for your placket, you might have an easier time with this one as I imagine your mistakes wouldn’t be as noticeable. Another thing I would change if I made this again (because I do like the look) is the way the sleeves are made. If you plan to make this pattern, I suggest you use the sleeves from View B (they fabric is doubled, which I think that would make them less oddly ruffled than the single layer sleeves from View A). I used ended up re-setting my View A sleeves about 5/8″ in from the original shoulder, and to me, they still don’t lay quite right. Since this was just a fun stash-busting project, I decided to let them be their weird ruffly selves. Overall, I’m confident that I’ll wear this, but I’ll probably wear it with a cardigan to hide my less than perfect sleeves and placket. And maybe some jeans, to camoflauge my winter legs! Not that I have to worry about actually being able to wear it any time soon…ahem mother nature, stop with the snow and rain! Really like your dress!! I am also having a horrible time sewing this top. It is so frustrating reading the instructions. I wish someone would post pic tutorial on this top. I had to take it apart and now going "very" slowly resewing it again! i don't really have ideas about fixing the collar.... that's sort of the focal point of the dress. I cold see sewing some rick rack or other edging along the edge if you wanted to hide the lines, though. Good luck. hope it works too! good luck!